Growing up in the Middle East exposed me to Lebanese and Gulf Arabic food. I instantly fell in love with dishes such as falafel, tabouli, kebbeh, shawarma, fatayer and machboos laham to name a few. When I moved back to Scotland, it soon became apparent that I would find it rather hard to get my hands on my favourite food. Ahead of my current trip to London with Ross, I asked my twitter followers for Lebanese restaurant suggestions. Noura Restaurant spotted my tweet and invited me to dine at their Belgravia restaurant. After checking our their menu, reviews and realising it was only a short journey away from our hotel, we booked a table. We were welcomed by owner Hani Bou Antoun who talked us through the extensive menu. In the end, I left it to Hani to choose our dishes as quite frankly, I couldn’t choose. Hani picked some popular dishes for us a try and it turned into a feast! To complement our dishes, Hani suggested we try his favourite Lebanese Wine, Ixsir Grande Reserve Red 2010. The wine is a mixture of Syrah and Cabernet Sauvignon, perfect to accompany red meat. Our waiter brought us a bowl of crudités to snack on along with a basket of fresh Lebanese bread which they make in-house. Not quite sure how lady like it is to snack on a whole cucumber and tomato in public though! Not before long, our selection of hot and cold mezze started appearing at the table as and when they were ready. It didn’t take long for our table to be overloaded. Everything looked too good to eat and smelt wonderful. The first dishes we tried were the cold mezze; hummous (puree of chickpeas with sesame oil and lemon), moutabbal (puree of grilled aubergine with sesame seed oil and lemon juice) and tabbouleh (parsley, crushed wheat, tomatoes, onion, lemon juice and olive oil). Using our fresh bread, I scooped up some hummous to try. It was the smoothest I had ever tasted. I couldn’t get enough. By far the best hummous I had the pleasure of tasting. I asked Hani how they made it and he revealed the secret was blending the chickpeas with ice cubes. By using ice cubes, it helps to regulate the temperature while ensuring that it’s the smoothest it can possibly be. I personally wasn’t a fan of the moutabbal, Ross loved it though and almost finished the entire bowl himself. There wasn’t any wrong with the dish, I’m just not a fan of blended aubergine or the texture. Tabbouleh has always been a favourite of mine and I haven’t had it in years. Upon first taste, you could tell how fresh the produce were. It was clean, crisp and well-balanced. A beautiful delicious salad. It worked well in the bread with some hummous added for good measure. Following the cold mezze, we were presented with plates of kebbeh (lamb and cracked wheat shell filled with seasoned minced lamb and pine kernels), sojok (spicy sausages), rikakat (filo pastry filled with mixed cheese), arayess (Lebanese bread filled with seasoned minced lamb and pine kernels) and my all time favourite falafel (bean croquettes chickpeas, garlic and sesame oil). Kebbeh is one of my favourite Lebanese dishes and Noura did not disappoint. They were utterly mouth-watering. Lebanese food is designed to be shared and I reluctantly shared them with Ross as he had never tried them before. Instant hit with the boyfriend. I added some hummous with kebbeh onto my fork, great combination. I couldn’t get enough of them. Hani recommended that we tried the spicy sausages, sojok, which were one of his favourites. The beef sausage meat are mixed with lots of garlic and a mix of aromatic spices. The intensity of the garlic is what you are first met with but luckily, it does not overpower the sausages. I could only eat a few though as I still had to try so many other dishes. It’s no secret that I adore falafel. I cannot get enough of it. I can honestly say that the falafel I tried at Noura‘s were the best I’ve ever had. They were beautifully crisp on the outside, soft and flavourful in the inside. Words cannot express how much I loved them. Dipped into some tahini as well as hummous along with some of the fresh bread, sensational. I want them right now as I’m writing this. Rikakat are little spring rolls normally with a mix of feta and cheddar cheese along with herbs and then deep-fried. They are delicious little parcels of pastry, simple to make and wonderful as little snacks. I could snack on these hot or cold. Yum! We still had more food to try but if I ate anything else at that moment in time, I’d burst. Unfortunately I did not try the arayess so left it up to Ross to try. They are rather similar to quesadillas, with the Lebanese bread being filled with minced lamb, pine nuts and toasted. Ross likened them to a kebbeh sandwich and that does sound rather good to me! Will need to save that for next time. Managing to find some space, Ross & I shared the Mixed Grill. Noura‘s version comes with three skewers of chargrilled meat; lahm meshwi (lamb), shish taouk (marinated chicken) and kafta meshwiyeh (minced lamb) along with a fattoush salad (mixed salad, lettuce, tomatoes, mint, sumak, onion and fried Lebanese bread). Each skewer was perfectly cooked on charcoal, lahm meshwi and shish taouk being personal favourites. Sometimes when you ordered meat that has been cooked on charcoals, it can be overcooked and dry. 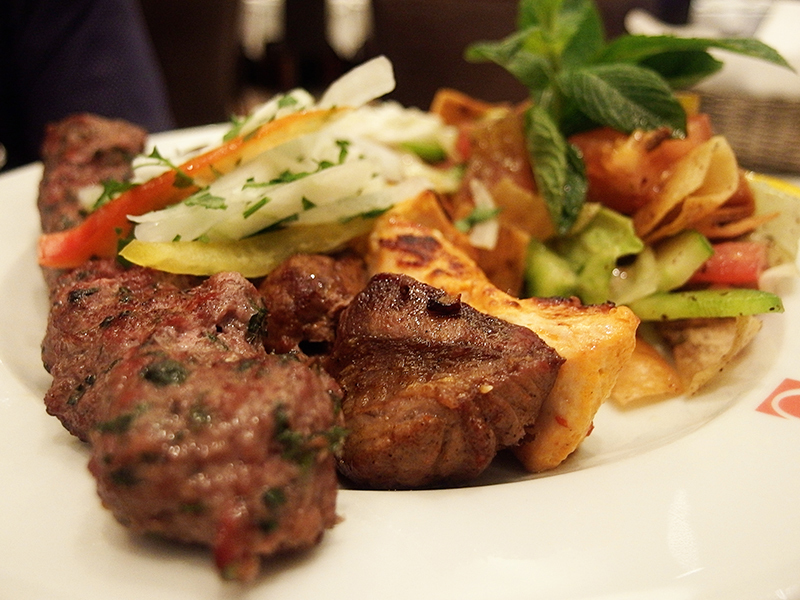 Thankfully, Noura impressed me yet again with flavorful, succulent and mouth-watering pieces of meat. Perfect scooped up with some hummous and Lebanese bread. After a well deserved break and chatting with Hani about the food, we were unexpectedly given a plate of baklawa and a selection of ice creams which are made in-house. I’ve loved baklawa ever since I was a child, I think that is where my love for anything pistachio based comes from. The baklawa we were given were so light and soft. Thankfully they weren’t heavy as I doubt I could have handled them. Hani informed us that they used to make the baklawa in-house but when the chef making the baklawa opened his own bakery, they now order from him instead. The ice cream selections (chocolate, mango, vanilla and strawberry) were smooth and creamy. The strawberry and mango were more like a sorbet and very well received after the amount of food we ate, but in all honestly, I could only fit in a little spoonful before resigning to the fact that I was well and truly stuffed. Overall, the food I tasted at Noura, has to have been one of the best meals I’ve had in a long time. I’ve missed good quality, authentic, home-style healthy Lebanese food and I now know where I’ll be returning on my future visits to London. The staff were very friendly and attentive throughout, even when the restaurant was filling up. It is a little on the pricey side for some dishes, but the quality of ingredients and food produced makes it value for money. What I loved about the restaurant, other than the food, was the vast amount of Arabic friends, families and embassy staff dining at the restaurant, the sign of a good Lebanese restaurant. If you are in the area or visiting London, Noura is not to be missed. Disclaimer: I was invited by Noura Restaurant as a guest in return for a review. Whilst my meal was complimentary, I was under no obligation to write a positive review and my comments reflect my true experience that evening.